Vestibular rehabilitation is a specific approach of physical therapy aimed at decreasing vertigo, dizziness and imbalance in those who have vestibular system dysfunction. Management of vestibular disorders is a complex problem. According to an article by Samy, et al,, dizziness and vertigo are among the most common symptoms causing patients to visit a physician and falling can be a direct consequence of dizziness in this population. The overall incidence of dizziness, vertigo and imbalance is 5-10% and it reaches 40% in people older than 40 years. The incidence of falling is 25% in people older than 65 years. Physical therapy @ ACAC offers vestibular rehabilitation for those who have acute or chronic vestibular dysfunction and balance dysfunction. Disease processes such as benign paroxysmal positional vertigo (BPPV), labyrinthitis, vestibular neuritis, Meniere's syndrome and other medical issues can affect the vestibular system. People may complain the illusion of the room spinning, lightheadedness, headaches, deconditioning and muscle tension as a result of vestibular system dysfunction. Our program will consist of an evaluation with an interview regarding your symptoms, medical history and functional limitations. 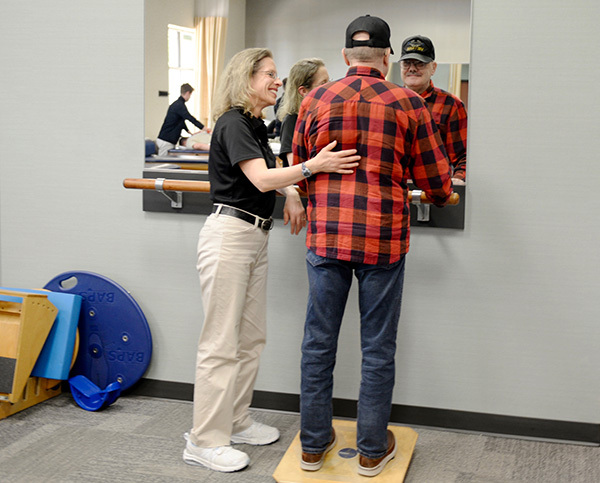 We will perform neuromuscular, oculomotor, positioning and balance examinations, then develop an individualized program to focus on your individual needs. The objectives of our program will be to decrease your feelings of vertigo/dizziness, improve your balance and postural control, improve your gaze stability, and improve your overall endurance. Please call our office for more information or to set up an appointment. We look forward to seeing you!